What is coral bleaching and why does it happen? Sporting a long beard and wide-brimmed hat, David Vaughan looks like a tropical version of John Muir. Instead of a mountaineering spiritualist, though, he is the director of the Mote Tropical Research Laboratory in Summerland Key, Florida. He is also decidedly more pragmatic than the famed naturalist. He is among a growing number of marine biologists working on novel approaches to coral conservation. The oceans are changing, and the future looks grim for coral and the ecosystems they underpin. But biologists and conservationists are furiously at work to ensure coral survive in the oceans, not just the history books. 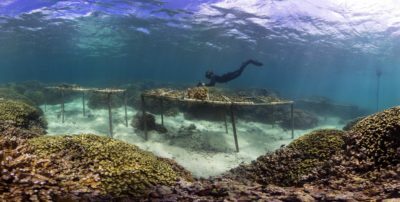 On the reef and in the lab scientists are discovering novel ways to prepare coral for the heat and acidity the ocean has begun to throw at them. And down in Florida, Vaughan and his team are devising new methods to coax the slow-growing animal into overdrive. Vaughan recounts how his lab used to grow coral. “I call it the old fashioned way,” he says. Normally it takes two years for Vaughn’s coral to grow from the size of a golf ball to that of an ice cream scoop, at which point his team would divide it into two or three pieces. It was a maddeningly slow process. But in 2009, Vaughan stumbled upon a method to increase coral growth rate fifty-fold. Two weeks after accidentally breaking a small coral he noticed it had regrown the dime-sized area that had been damaged, and area that took two years to grow initially. And the small fragments that had broken off had grown to the size of a nickel. Using this micro-fragmentation technique, Mote went from producing 600 corals in six years to 1000 corals in three or four months. Short on room, they began placing the coral fragments closer together on the racks. Normally coral will attack each other if they grow too close together, but Vaughan noticed that the clones began fusing with each other. After all, they were originally the same colony. Now in one to two years the lab could fragment, grow, and recombine coral to achieve a size that would normally take 100 years to reach. What’s more, these recombined colonies became reproductively mature, which usually happens after 25 to 75 years, when the coral reaches the size of a basketball. “That would be like saying we produced a hundred little seedlings, but we merged them all together the size of a tree trunk, and then they started producing acorns because they thought they were a tree,” says Vaughan. The ocean is getting warmer and more acidic, posing a two-pronged assault on coral. In a process called bleaching, higher temperatures stress coral, which evict the colorful algae that live in them and provide them with food. The bleached coral often die afterward. And if that wasn’t enough, dissolved carbon dioxide creates more acidic water, which hinders the coral’s ability to build their iconic limestone skeletons. Heat, rather than acidity, currently poses the greater threat. This threat is no more visible than on Australia’s Great Barrier Reef. Last April 93 percent of the reef had bleached by time the 2016 southern summer ended. And it seems fortune has afforded the iconic reef little time to recover. Just this month reports emerged that the reef is suffering a second mass bleaching. The unanticipated pace of change has jolted the marine science community into action. Marine biologists have started to realize the importance of ensuring the coral they plant are prepared for the pressures are already beginning to face. “Instead of planting out the next set of climate victims, we’ll actually be planting out coral that we might expect to be a bit more heat tolerant,” says Andrew Baker of the University of Miami, in Florida. 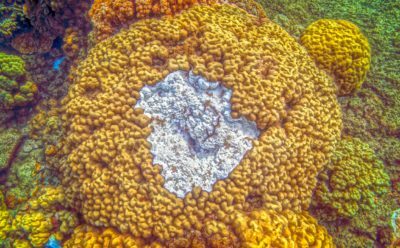 Baker has found that gentle, controlled bleaching forces coral to switch which of its many symbiotic algae strains it relies on most heavily. He places young coral in floating racks where the intense sunlight and warm water near the surface partially bleach them, inducing the symbiotic shuffle he calls “stress hardening”. In January his experiment moved out of the lab. Right off the city’s famous South Beach he will be stress hardening 1,600 of the 10,000 coral set to be planted on local reefs. If the treatment improves the coral’s resilience, Baker plans to disseminate the technique among coral growers and conservationists. Other biologists have taken a different approach to strengthening the algae’s resilience. Madeleine van Oppen, who leads teams at the University of Melbourne and the Australian Institute of Marine Science, has cultured the algae under conditions that mimic climate projections. After the algae evolve and adapt to their new environment, she introduces them into young coral to see how they fare. The experiment is still underway, but results, she says, are promising. Eager to embrace all of the options available to her, van Oppen has also turned to traditional selective breeding — the kind used on crops and dog breeds — to jump start the coral’s evolution. She is crossbreeding similar coral species, attempting to create individuals tolerant to higher temperatures. Halfway across the Pacific, Ruth Gates is hard at work on a similar project in her role as director of the University of Hawaii’s Institute of Marine Biology at Manoa. Gates took advantage of a 2015 bleaching event in Hawaii that made it easier to identify more resilient coral, which survived the event, from those that didn’t. She then bred these together last June in the first selective breeding experiment aimed at producing heat-tolerant coral. Gates says that, so far, the baby coral have fared well in warmer water, and she plans to breed the next generation when this group reaches maturity in two years. Gates and van Oppen are working together to investigate whether baby coral grow better in controlled settings with filtered seawater or in outdoor tanks with unfiltered seawater. “When it comes down to implementation, the goal is to grow a lot of coral as quickly as possible and to get that coral back out onto damaged reefs,” says Gates. 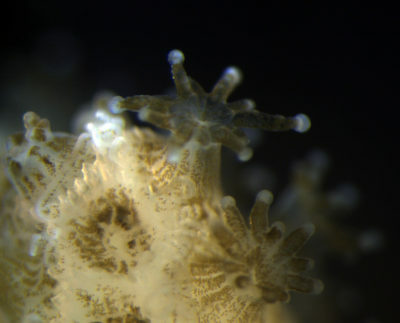 Gates has also successfully conditioned coral to higher temperatures by exposing them to warm water in the lab. Her next goal is to work with engineers to take the experiment to the reef that surrounds the small island where she works. If she can raise the temperature in sections of the reef, she is confident that she can increase the heat tolerance of the wild coral without removing them from the rocks. Biologists are only beginning to understand coral genetics. Over at Stanford’s genetics department, Phillip Cleves is excited about a common aquarium pest: an anemone that shares the coral’s symbiotic relationship with algae. He uses the fast-growing anemones, which are related to corals, to investigate which genes make them susceptible or resilient to the stresses that often lead to bleaching. He uses what he calls the “knock out, knockdown” technique. He completely disrupts a particular gene’s expression, which allows him to determine what it does by recording what changes in the animal when the gene is knocked out. He can also lower the expression of the gene, or knock it down, which helps him determine the impact of the gene at different levels of expression. “[It] would be really nice to have a set of genes that we can monitor the expression of in corals, … to ask ‘what state of stress are they in?’” says Cleves. He also hopes his work will help conservationists identify individual coral that show promise for breeding. While Cleves pores over the genetics of the coral-algae relationship, Hollie Putnam, a biologist at University of Rhode Island, investigates how a coral’s epigenetics influence its success, and that of its offspring. The epigenome is the instructions that dictate how genes are expressed. If the genetic code is the alphabet, epigenetics is punctuation, says Putnam. For instance, “well” has the same spelling as “we’ll,” but the punctuation radically alters the meaning. An animal’s environment affects its epigenome, which can change within its lifetime. Since these changes can also be passed on to its offspring, they offer a mechanism for coral to adapt more quickly than conventional natural selection, in which helpful traits spread through a population over many generations. Putnam says that the offspring of coral exposed to higher temperatures and more acidic water grew more quickly and survived more often than those whose parents weren’t put through their paces. This is good news for coral considering the challenges they face. “If we do not mitigate fossil fuel burning, we would estimate that the majority of the world’s reefs will be massively degraded by 2050,” says Gates, who is also the president of the International Society for Reef Studies, the organization that issued the statement. And like a forest, a reef is greater than the sum of its individuals. It’s the assemblage of diverse corals in one place that creates the structure that literally serves as the ecosystem’s foundation, says Gates. There will always be some corals that survive, but a few trees do not make a forest. “I think corals will be evolving as we speak,” says van Oppen. “But … it’s unlikely that that natural rate of evolution will happen fast enough, because if it would we wouldn’t have lost as much coral as we have,” she adds. Van Oppen stresses the need for early intervention, as she thinks that this is cheaper, more effective and more efficient than trying to address a problem when it has become dire. Harrison Tasoff currently serves as Scienceline’s physical science editor working on stories ranging from special relativity to minerology. Outside of the physical sciences, he has a tender spot for the marine biology beat. Harrison has a bachelor’s degree in mathematics from Swarthmore College and is pursuing a master’s in science journalism at NYU. Harrison grew up in sunny Southern California watching science shows and exploring tide pools. He is an avid mineral collector and when he’s not writing you can find him tending his bonsai. You can follow Harrison on Twitter here. Feel Good projects generate tons of money that should be used to clean up our pollution. Corals are disappearing because of atmospheric, oceanic and land based pollution. Who’s kidding who here? Opening photo and title makes one hopeful in these bleak times. Very comprehensive article. I would be interested in learning more about the breeding methods and whether quantitative genetic methods are involved.